We're going to learn how to play the most common pop accompaniment groove on piano in this next piano lesson. Now that you know how to play chords in nearby inversions with the right hand and the bass in the lower register with the left hand I want us to discuss the rhythmic element in details. We will learn to combine interesting rhythms between the right hand and the left hand in this next piano lesson in order to create an interesting pop piano groove and some other grooves for various styles. We will start with the most common pop piano groove in this piano lesson. I will show you how to play it in steps. So far we have only talked about playing chords in blocks. What I mean by that is that I guided you to play both the harmony and the bass at the beginning of each bar and keep it pressed for the value of the whole bar. If two chords appear in one bar you should play two block chords for every two measures. Now some find it difficult to keep the timing. Basically you should always count the beats while you play; at first aloud and later by heart. If you should play a block chord that lasts four counts count 1-2-3-4. Dividing the chord into small equal rhythmic beats helps to keep the unity of the rhythm. Now that we are able to play the SKELETONE of the song we can add the groove. A groove is a pattern of one or two bars which involves a rhythmic combination between the right hand and the left hand. This pattern repeats for every two bars of a song, sometimes with a variation. This pattern is built according to the genre of a song. A Pop piano groove would sound differently than a reggae groove for example. Why? Because every style of music has a different rhythmic approach. What we basically do is taking a rhythmic groove that is usually played by a full rhythm section (Bass, Drums, Piano and/or Guitar) and bringing it down to a rhythmic pattern that is played only by the piano but contains the essence of the full groove, played by the whole band. When you a play a pop piano groove for example the left hand will imitate the bass part, the right hand might imitate the guitar or a full piano part and the combination between these parts will give a clue on how the drums act in the song. That's why I always say then when I play a groove I feel the drums part inside of me and although no drums are present my intention communicates it between the lines. Here's an example of one of the most common pop piano grooves. This pop piano groove is common not only in the pop scene but also in folk songs. I developed a method that makes it very easy to play different grooves and keep the rhythm at the same time. The following formula tells you what you have to do with every beat in a certain bar. 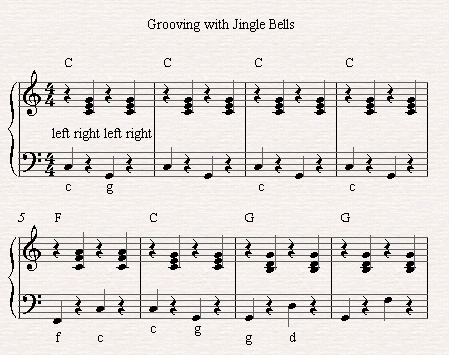 This pop piano groove which we are going to use when we play the song Jingle Bells in the next piano lesson is based on playing the bass on the first and third beats (C and G for example on a C major chord) and the chord in the right hand on the second and fourth beats. Why do I choose C and G in the bass? Well, C is the root of the chord, the note which upon the rest of the intervals are built on. 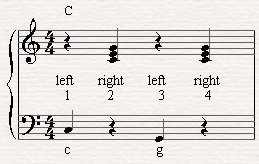 G is the fifth of the chord. Why do I call it the fifth if you can see only three notes? Remember how we found the C chord? We went along the white keys, starting from C, then we played one key and skipped one key. If you'll look at the whole process you'll realize that G is the fifth note in the sequence, starting from C.
We're going to discover over two lessons or so that this sequence, starting from C and moving through the white keys, is called a scale a C major scale. So G is the fifth note of a C major scale and it has an important harmonic functionality in a C major chord. The pure fifth interval which is the interval created between C and G is considered to be one of the most steady intervals in music. That's why we're going to play the firsts and fifths of chords in many bass line of many pop piano grooves. Watch the tutorial above to get a clear demonstration of how I play this pattern (coming soon). This pattern repeats through the whole song. 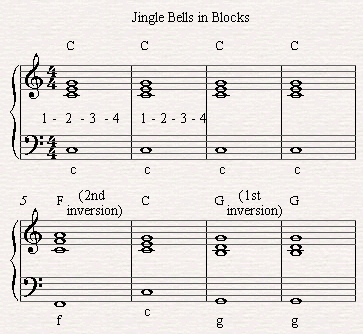 Jingle bells for example opens up with four bars of C major and each bar lasts four beats. So basically we're going to repeat this pop piano groove pattern for four times on a C major chord before we play the same pattern on an F major chord (The fifth bar of Jingle Bells moves to an F chord). Now, this pop groove pattern is based on equal quarters and we started with it since it's easy to count along with it and since it doesn't demand a complicated technical ability. As we go on with our piano course the groove patterns will get more complicated so you should basically practice one or two bars which are based on one chord and then try to place the pattern while moving between the different chords of a song. 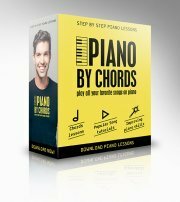 Check out our complete "Piano by chords" course where you'll go through a journey that combines both piano lessons and piano tutorials that will make you play the piano like a PRO!